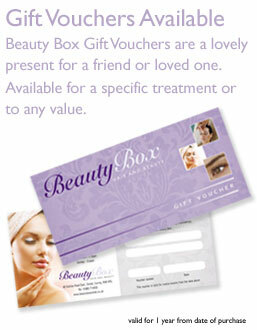 Beauty Box gift vouchers are a lovely present for a friend or loved one. They are available for a specific treatment or to any value. Vouchers are valid for 1 year from the date of purchase and cannot be extended once expired. Vouchers are non-refundable and can only be used towards treatments or retail products purchased from Beauty Box only. Only original Beauty Box vouchers accepted. Spend over £20, get one stamp. When the card is full you will receive £10 off your next treatment at Beauty Box. *Discount applies to their first visit only. We offer 10% student discount between the ages 11-18yrs. Available Wednesdays and Fridays on hair services.